Capt. 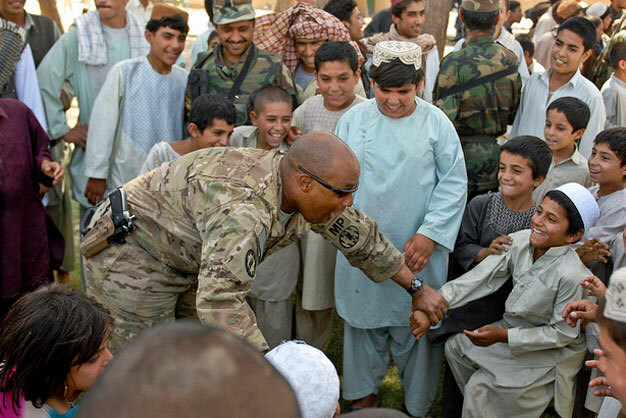 Derrick W. Dew, commander, 202nd Military Police Company, currently assigned to 1st Brigade Combat Team, 4th Infantry Division, interacts with young residents of the “Old Corps” area of Kandahar City June 8, during a ribbon cutting ceremony for a new soccer field there. The new field was one of many projects headed by TF Raider and their Afghan National Security Forces partners in their joint-reconstruction efforts to improve quality of life, safety and security for residents of Kandahar City. Photo via US Army.